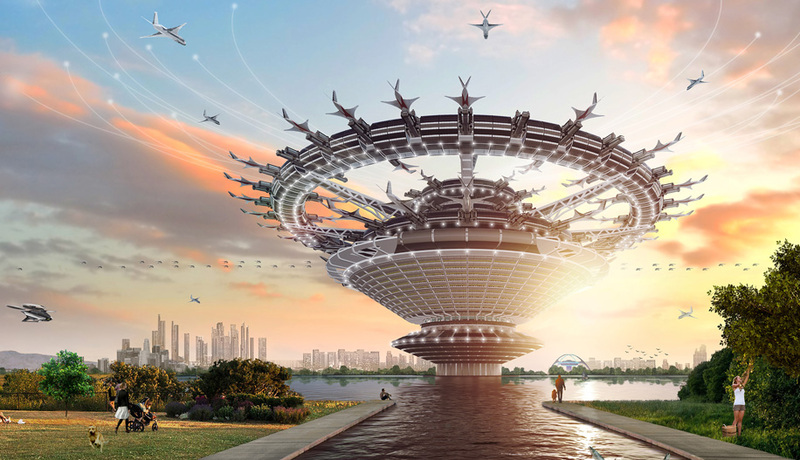 “Airports designed around verticality would no longer have to be confined to the very outer reaches of urban areas and could be located closer to urban activities and populations”. Our architect has been watching far too many episodes of Star Trek…..Having said that, it’s a fact that Star Trek has inspired inventors and scientists to recreate gadgetry thought up in the mind of Gene Rodenberry and his successors…..that gadget that we can’t seem to do without —our mobile phone !! Brilliant that the iconic Theme Building is still deemed modern enough to survive and make an appearance (back right) in the future. …so no more bus transfers then. Every flight will have a gate. Ryanair´s costs heading north?